This healthy spin on Ranch packs a serious punch of garlic and fresh herbs. We love it with fresh veggies and rippled potato chips. Prefer more of a salad dressing? Just add milk, a tablespoon or two at a time, until you reach the consistency you want. Are you ready for the Final Four? Let’s get ready to ruuuumble! Okay, I must admit: I’m not all that into basketball. But I am into any excuse for game-day food. I’m also not into toiling away in the kitchen while everyone else snacks happily in front of the TV. But I am into sitting in front of the TV with my friends and chowing down alongside them. Not into: prepping for hours and hours right before a party. Into: make-ahead, easy-peasy appetizers. This is why I love dips. 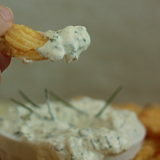 Dips are the quintessential make-ahead party food, and people not only love them, they sort of expect them. Plus, they’re oh-so perfect for making ahead of time. Here are a few dip ideas and pointers that’ll help keep you happily hanging with your friends instead of sad and banished in the kitchen. Make it hours – or in some cases, even days – ahead of time, then just pull it out of the fridge and serve with chips and veggies. Done! So many refrigerated dips taste so much better when they’ve hung out in the fridge for a few hours. So not only can you make them ahead of time, they taste much better too. Win, win! 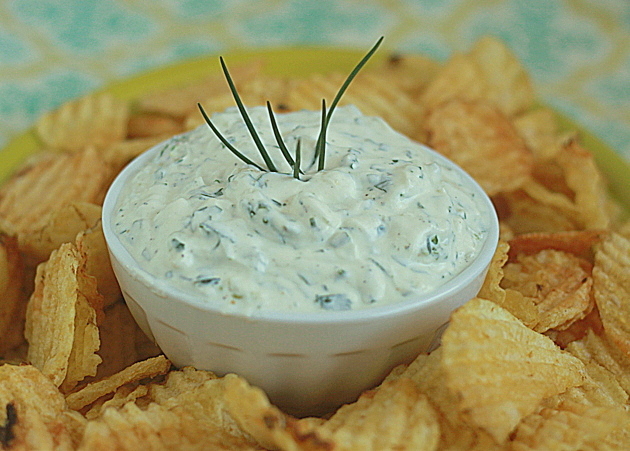 Try Kopanisti (Greek feta pepperoncini spread) or garlicky Greek yogurt ranch dip (recipe below). Assemble everything ahead of time, refrigerate, and then just pop it in the oven once everyone shows up. The only time you’ll spend in the kitchen is moving it in and out of the oven. Try this recipe for cheesy Mexican corn dip, which can actually be served hot or cold. Ah, the wondrous slow cooker, the make-ahead workhorse of the kitchen. How I love it so. Whip up your dip in the morning, or if you have a Crock Pot with a removable insert, assemble the ingredients the night before and refrigerate overnight. Try keeping a big batch of easy caramel apple dip in the Crock Pot on the “warm” setting for a dessert dip that’ll have them clamoring for more. 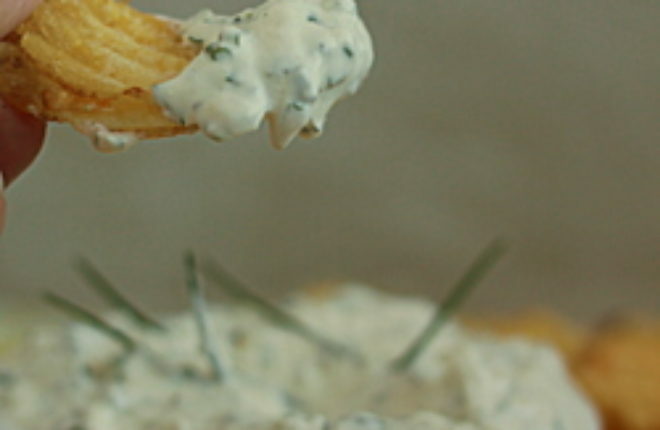 In a medium bowl, stir together the Greek yogurt, mayonnaise, vinegar, garlic, scallions, chives, parsley, and thyme. Add salt and pepper to taste (I usually start with 1/4 teaspoon salt and a small sprinkle of pepper then go from there). Stir in Tabasco sauce if using. Refrigerate in an air-tight container for at least an hour before serving. Serve with potato chips, carrot sticks, celery sticks, lightly-steamed broccoli, sliced cucumber, or whatever else suits your fancy. Keeps refrigerated for up to one week. This post is part of BlogHer’s March Madness Game Day Eats editorial series, made possible by Kettle Brand Chips. I share your views on basketball. That looks like a dip I could get on board with! Love the Greek yogurt as base. 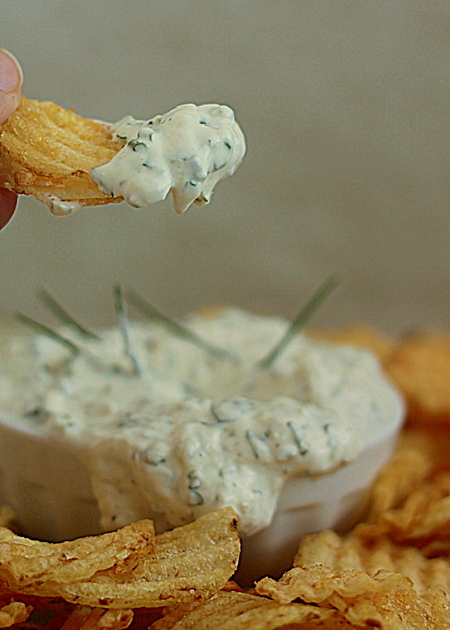 Love dips as party apps! You’re right – so easy to make and great to do the day before. I always have at least one out for a party!